On the River Trent at Westbridge Park, Stone, just off the A34. Sessions throughout the week according to age and ability with permanent training gates and floodlights. New clubhouse offers changing facilities, gym and boat storage. Stafford and Stone Canoe Club is centrally located in the country and offers the advantage of great training all year round plus relatively easy access to all the major slalom sites. This was once the home of Richard Fox, among many others, and still boasts an impressive list of paddlers who are competing at the highest level. At first sight, the river Trent at Stone doesn’t seem very exciting. The river is channelled by stone walls which form well defined eddies, but there are no waves. The river though is perfect for honing technique before moving on to more difficult water. 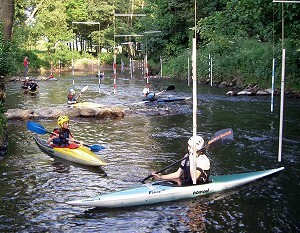 The other advantage is that it is easy to paddle back up the entire course. This makes more intense training sessions more viable. And there are permanent floodlights for the winter. No excuses! 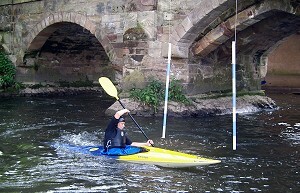 Stafford and Stone CC organise 3 ranking slaloms here each year, but they are most famous for the Mini Series held in January and February, which attracts paddlers of all abilities from complete beginners to International athletes, placing them all on an even footing with a handicap system. From the South: Exit M6 Junction 14 and head North on A34. Turn right into Stone at the roundabout with the Shell Garage. Cross the river and you will find the canoe club on the right. From the North: Exit M6 Junction 15. Follow the A500 and then A34 South towards Stone. Turn towards Stone at the Roundabout with the Shell garage. Cross the river and you will find the canoe club on the right.